The Stairplan Birch 24 compact loft open plan space saver staircase is a quality openplan spacesaver staircase at a modest price. Designed with recessed 24mm birch plywood treads, 32mm engineered pine strings and birch plywood riser downstands, this openplan spacesaver staircase will withstand use for years to come. The Birch 24 openplan spacesaver staircase is built to the highest standards with the full paddle of the tread and the risers recessed into the strings. The staircase can be manufactured in any width up to 800mm with up to 16 risers. 90° landing turns and optional traditional style balusters and handrails and carpet inserts are available on the Birch 24 spacesaver staircase range. The Birch24 Openplan spacesaver staircase is also available as a closed plan spacesaver staircase. 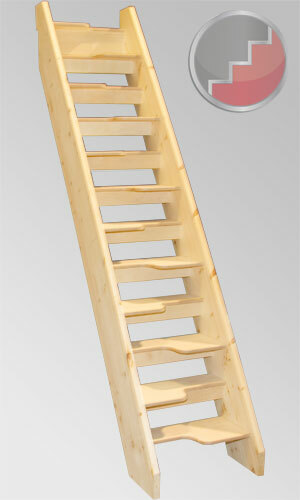 This staircase can be delivered fully assembled or flat packed for assembly on site depending on your requirements.